Matudnila.com - A Cebu Events Blog: Bijoux Cebu-Asia's Destination for Green Jewelry. Home Shangrila's Mactan Resort an Spa Bijoux Cebu-Asia's Destination for Green Jewelry. 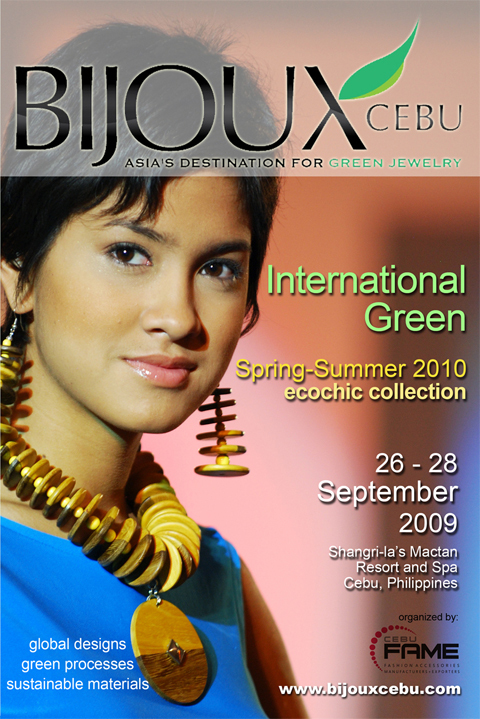 Bijoux Cebu-Asia's Destination for Green Jewelry. Bijoux, read as \ˈbē-ˌzhü\ is a French word which means small dainty usually ornamental piece of delicate workmanship or something delicate, elegant, or highly prized or just to cut short it means "Jewel" or jewelry. BIJOUX CEBU “Asia’s Destination for Green Jewelry” – Spring-Summer 2010 Collection is an international trade exhibition of fashion jewelry and accessories showcasing exclusively Philippine-made products in an event designed to be both a commercial and social experience. Happening on dates September 26-28, 2009 at the Prestige location of Shangri-la’s Mactan Resort and Spa, Cebu, Philippines. This international event is absolutely free as its a Trade-only Exhibition organize by Fashion Accessories Manufacturers and Exporters Foundation Philippines, Inc. (FAME Foundation) and is well supported by Private and Government Agencies to name some: Export Development Council, Department of Trade and Industry, Department of Tourism, Department of Science and Technology, Department of Environment and Natural Resources and Provincial Government of Cebu. A special showcase featuring Philippine natural fibers and components will be highlighted in celebration of the International Year of Natural Fibers. To present buyers with the widest-range of Philippine green jewelry on location in Cebu, which is the capital of the fashion accessories industry in the Philippines. 3 comments: on "Bijoux Cebu-Asia's Destination for Green Jewelry." So free yung admission pala. Bakit sa Shangrila yung venue, marami namang lugar sa Cebu City? Hi Sara, yeah really exciting! Cebu FAME chooses Shangrils Mactan Island Results bhecause of its location nearby the seashores of Islands of Mactan and besides the traffic towrds the resort is not that heavy compared here in the city.